Despite our best intentions, keeping extra calories at bay over the holidays can become a full-time job! Between the holiday parties, cookie tins at the office and family gatherings, the temptation to indulge is ever-so-present. Avoid the traditional holiday weight gain with a few simple food swaps and holiday party strategies. 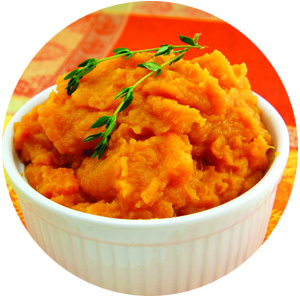 The Fix: Switch white potatoes out with nutrient-packed sweet potatoes. Serve mashed with a small dab of butter and cinnamon, or bake up some crispy cinnamon-dusted sweet potato rounds at 450 degrees for 25-35 minutes, depending on thickness. Want to cut the carbs further? Swap out the potatoes for mashed cauliflower. You can make them extra creamy by whipping them with a touch of cream cheese or heavy cream. 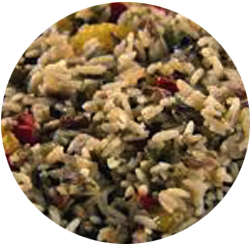 The Fix: Replace the traditional bread stuffing with wild rice “stuffing” for less refined carbohydrates and saturated fat. Simply sauté 1 cup each of diced celery, diced onion and uncooked wild rice with 2 cloves of garlic for 3 minutes. Stir in 4 cups of chicken broth and fresh sage, bringing to a boil. Reduce heat and simmer for 25 minutes before adding in 1 cup of uncooked brown rice. Once it comes to a boil, reduce heat and simmer until there is no liquid in the pan. Toss in your favorite sautéed veggies, or add a touch of sweetness with dried cranberries. The Fix: Roasted brussels sprouts give you crunch of the traditional fried onion-topped casserole, minus the extra sodium and fat! Roasting your veggies brings out their natural sweetness. Simply drizzle with olive oil and add salt and pepper to taste. Roast for 25-30 minutes at 450 degrees or until they are dark in color. Make them extra easy with a balsamic glaze. Bring balsamic vinegar to a boil with a small amount of sugar to thicken. 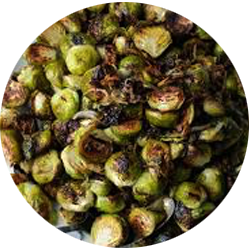 Reduce to medium heat and cook for 15 minutes, or until thick, and toss with the brussels sprouts. You could also try with broccoli or cauliflower! The fix: Swapping out a slice of vegan pie with pumpkin pie will save you more than 300 calories, 16 grams of fat and 20 grams of sugar! 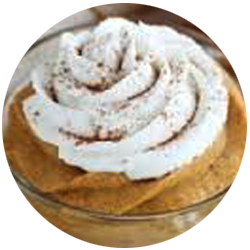 Or whip up a spiced pumpkin mousse, folding in one cup of whipped heavy cream into one can of pumpkin puree, 1/3 cup evaporated milk and 1 box of pumpkin flavored instant pudding mix. Chill for up to four hours before serving. Make this dessert extra special by serving in martini glasses and topping with spiced pecans. The Fix: Just one cup of eggnog has more than 300 calories and 15 grams of fat! 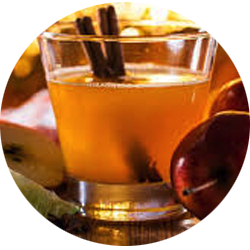 Slash up to 150 calories and all of the fat by replacing this holiday staple with apple cider. If you can’t imagine a happy holiday without eggnog, make your own with egg whites and fat-free milk. Blend with honey, vanilla, nutmeg and cinnamon, and heat over medium-low heat for 15 minutes, being careful not to let it boil. Chill overnight in the fridge before serving. Size matters! When eating, fill a small plate and take small bites of your food. Use the same tactic with drinks, taking small sips to enjoy it over a longer period of time. Eat a real meal before you attend a party that is scheduled between typical meal times, such as an evening cocktail party. Save calories on holiday beverages by committing to limiting yourself to two drinks per event. Enjoy a glass of water between beverages to keep you hydrated – and full!